On behalf of our vibrant and diverse parish, we want to welcome you to St Finbarr Church. Here, we gather each week to celebrate the Sacred Mysteries of our faith with the fullness of our beings. We invite you to join us for worship, spiritual growth, friendship, support and activity every week in celebration of the Eucharist.! The staff and parishioners of St Finbarr are committed to being hospitable and welcoming to all God’s people. We hope that you will join us on Saturday at 4:30 pm in English or on Sunday at 8:00 am in Spanish, 10:00 am and 11:30 am in English and participation in the Eucharistic liturgy. 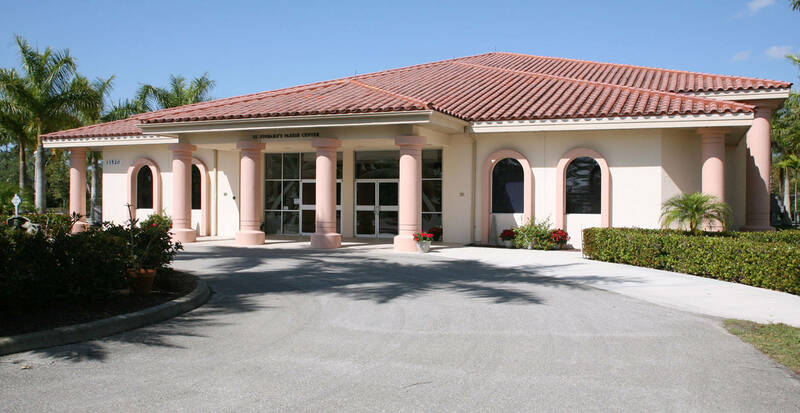 Please visit the various pages of our website to learn more about St finbarr Parish in Naples, Florida. St Finbarr Parish was founded as a mission chapel of Marco’s San Marco Catholic Church in 2000. Funds were provided by San Marco to build an all-purpose building that served as a community center as well as a place to celebrate Mass. Over time, through the work of dedicated priests and with the support and assistance of a small group of members, the St. Finbarr community grew. It has grown to a place where during season approximately 1,500 attend weekend Masses. On Dec. 12, 2010, Bishop Frank Dwane elevated it to a parish. It is now the 57th parish in the Diocese of Venice. Our building is known as a parish center and the park-like setting was designed to be ecologically sensitive. The site has plenty of room to build a freestanding church. A prayer circle with a babbling fountain that is frequented by deer is directly across from the entrance of the parish center. The stained glass windows in their parish center are in keeping with the surroundings. Each of 14 windows has a tree in the center. The tree may be interpreted as the Tree of Life. Each window has a bird that represents different Christian values. The colors are rich; the feeling restful. The area behind the altar is painted a rich harvest gold. Local artisans made a walnut cross on the wall behind the altar. Fr McCarthy was the pastor of San Marco when the mission church was founded. The choice of St. Finbarr as the community’s patron saint reflects his Irish heritage. St Finbarr was the son of an artisan and a lady of the Irish royal court. He was born in the middle of the 6th century in Connaught, Ireland and baptized Lochan. He was educated by monks who named him Finnbarr because of his light hair. He evangelized the people in Gowran, Coolcashin and Aghaboe and founded a school at Eirce. He later founded a monastery on the River Lee that became famous and attracted numerous disciples. The city of Cork grew around the monastery and he later became Cork’s first bishop.